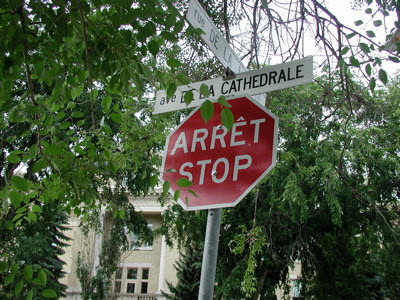 Even the stop signs in St. Boniface are in French and English. Sue Frause photo. Winnipeg's St. Boniface is home to the largest French speaking community in Western Canada. Founded in 1818 by Bishop Joseph Norbert Provencher as the first Roman Catholic mission in the west, the Franco neighborhood is within walking distance of downtown Winnipeg and The Forks via the Esplanade Riel. In the heart of Old St. Boniface, Winnipeg's French Quarter, is La Maison Gabrielle-Roy. Tucked away on sleepy Rue Deschambault, which gave name to renowned Canadian author Gabrielle Roy's more famous works (Street of Riches), the home has been restored and is now a year-round museum. You can also begin a walking tour of St. Boniface guided by the words of this celebrated author. The Economic Development Council for Manitoba Bilingual Communities has produced its latest edition of the Joie de vivre tourism guide. It's filled with information about Manitoba's Francophone communities in the City of Winnipeg (St. Boniface-St. Vital-St. Norbert), the bilingual communities in the south of the province and the Metis community of St. Laurent.